I arrived fairly early as I had the key to the village hall, but Brenda and Sharon had got there before me and were waiting outside! The first thing we had to do was find mops and buckets and give the floor a clean as it was very sticky after what had been evidently a good party the night before. 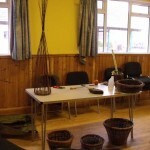 As I have mentioned in the past, our village hall is a well-used facility! 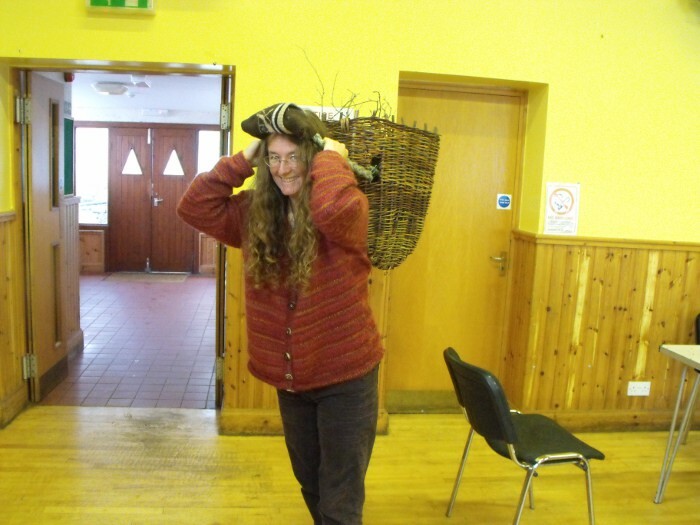 While Sharon and I mopped, Mandy arrived with a basket of peat carried in the traditional way – in a basket on her back, as in the photo below. By this time, Brenda was installed in the kitchen busy getting prepared to make the tattie soup – soon to be joined by Maureen and her potato peeler. Others started to appear, tables and chairs were put out, and the hall began to fill with the makings of the exhibition of the sorts of activities which nowadays are considered “crafts” and are normally done as a hobby or small business, but which in times gone by were a necessary part of life. The carding and spinning section was to be in the corner of the hall, opposite the door. 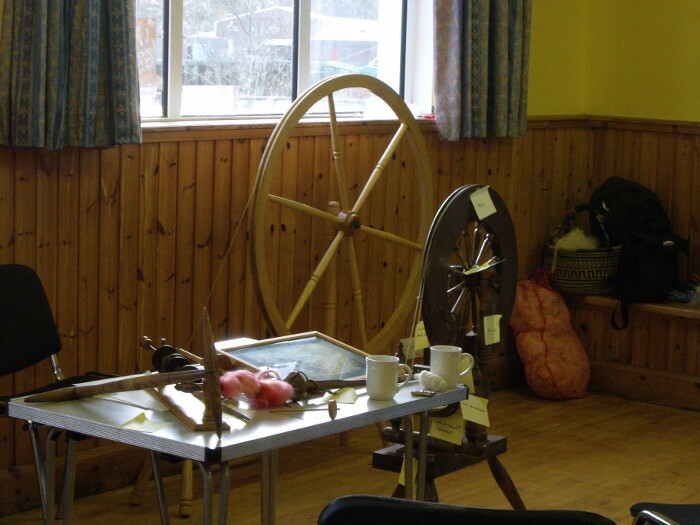 I had brought my Great Wheel with me – a copy of an 18th century wheel which was appropriate for the pre-1812 time scale, although I couldn’t say whether the people who lived in the house at Glenleraig would have had a wheel of this ilk – I really don’t know. However that mattered not a jot, we were there just to give a flavour of what might have gone on in the house when people were living in it. One thing that certainly would have gone on was the necessary preparation of the wool in the form of carding – Helen Stevens was in charge of that and I was very interested in the number of people who wanted to have a go at it. I have always enjoyed carding, finding it quite a relaxing occupation which one can do quite happily in front of the tv, but most spinners find it a chore and can’t be bothered with it. Helen enjoys carding and was more than happy to demonstrate and also to teach others this particular skill – not an easy thing to do! I had also brought along my Scottish castle wheel – which is probably the only working example of this type of wheel as it was copied for me from a photograph of the one which resides in a museum in Edinburgh and which doesn’t work. The castle wheels seen around the spinning world nowadays are of Irish origin, quite different from the Scottish wheel, and with the string footman which the Irish prefer. I hadn’t brought along this wheel with the thought of spinning on it – rather I set it up and covered it with “post-it” notes giving the Gaelic names for the parts of a spinning wheel and I thought it rather looked as though it had measles Again, I was quite surprised by the interest in the Gaelic names, and in fact I took the card of someone – a visitor to the area – who was interested enough to ask for a printed copy of the list! I also set up a table with spindles and a distaff on it, and one or two other things for display purposes. Quite a few people had a go at spinning on the wheel – and I also taught Mandy how to spin on a spindle, which she took to like a duck to water. Obviously, with the size of my wheel and all the bits and pieces needed, Helen and I occupied the largest corner of the room. 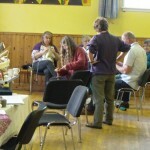 Next to us, Helen Lockhart set up her table with the logical next step – knitting and weaving. Helen is a knitter, and the weaving side of things was done by Bridie, who had brought along a small upright weaving frame which nevertheless had all the components of a hand operated loom, just on a smaller scale. 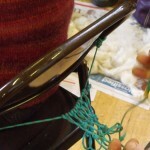 Beyond Helen and Bridie was Claire and her basket weaving. Whether or not the occupants of the house at Glenleraig would have spun wool, knitted or woven – and it is more than likely they would have done these things – they would most certainly have made baskets. Baskets were essential for life – used as they were in one form or another for carrying peats, creel fishing, storing tatties – you name it! 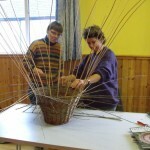 Claire was making a basic general purpose basket, and for that she had soaked willow saplings in the loch by her house in Stoer for a couple of days to make them supple enough to weave. 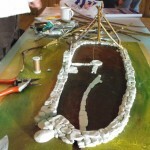 She had already made the base, and I was somewhat amazed to see sort of a “wigwam” appear on her table – have a look at the photograph to see what I mean by that. She explained that as one starts weaving the upper part of the basket, the long saplings need to be kept in some sort of order – hence the appearance of a tent! Over the course of the day, I watched the basket taking shape with different people adding their layers of willow. When the basket was finished, Claire donated it for the raffle which was to take place during the cèilidh planned for the evening. During the morning, Mandy got a peat fire going – outwith the hall, not in the middle of the floor I hasten to add! The idea of that was to give something of the smell which emanates through the roofs of taighean tugha when the fire is lit in the house – which would have been all the time baring accidents – and which would have permeated the whole township. Unfortunately, when the fire was first lit, the aroma was in competition with the smell of fish from the nearby harbour where a trawler was being unloaded! Around midday some of the members of our choir turned up and we went through into the Community Room for a quick practice before singing three Gaelic songs, which were very well received. After a lunch of Brenda’s delicious soup and home-made bread, the choir left to sing at the Christmas bazaar in Elphin – unfortunately the dates had clashed. I enjoyed the Elphin bazaar last year, but this year I was committed to the exhibition in Lochinver, and so stayed behind. I certainly don’t regret that – it was no sacrifice for me! – and one of the reasons was that shortly after the choir left, Willy MacLeod – known as Willy Achmelvic as he comes from there – arrived to demonstrate the art of net repair. This I found quite fascinating and I have to say that I had to ask him to demonstrate the work very slowly so that I could get a photograph! All in all, the whole event was very successful. About 60 people came through the door during the 6 hours it was open, and evidently 60 came to the céilidh in the evening which was held at Drumbeg village hall. That was an extension of the wider event, and was built around our own James Graham – native of Lochinver and now a quite renowned singer of Gaelic songs – deservedly so as he has a wonderful voice. He was singing songs of Assynt which are not normally performed and are part of his own personal collection. I quite wished to have been there but at the same time was somewhat tired after what had proved a busy but most enjoyable day. 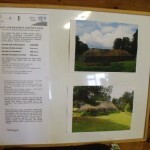 This entry was posted in Local area and tagged house at Glenleraig, local exhibition. Bookmark the permalink.